The LEGO Movie 2: The Second Part holiday short brings a giant Christmas tree to Apocalypseburg. In a clever form of marketing, the studio has released the short holiday special to promote the highly anticipated sequel, which hits theaters early next year. Chris Pratt's Emmet decides that Apocalypseburg needs some Christmas cheer, so he sets up a huge holiday party, complete with a festive tree that can be seen from space. Elizabeth Banks' Lucy isn't so sure about the whole plan, but everything works out in the end. Will Arnett's Batman can be seen ice skating, drinking eggnog and complaining about his ugly Christmas sweater not having the correct amount of abs, while Jonah Hill's Green Lantern helps to light the Christmas tree. Alison Brie's Princess Unikitty even gets in on the fun by barfing up some glitter on to the tree. 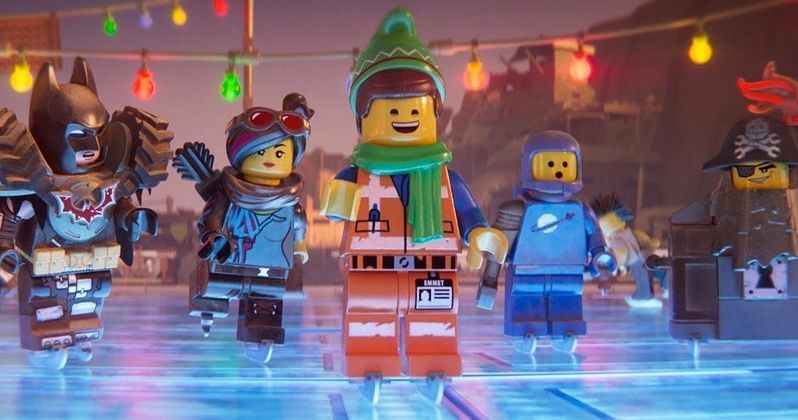 The LEGO Movie 2: The Second Part holiday short is a nice little treat for fans that have been waiting for the sequel. And though it is short, the quality control is there, as well as the voices, which gives it some extra charm, instead of coming off like a commercial for the upcoming sequel. The LEGO Movie 2: The Second Part cast features Chris Pratt, Elizabeth Banks, Tiffany Haddish, Will Arnett, Stephanie Beatriz, Charlie Day, Alison Brie, Nick Offerman, Maya Rudolph, Channing Tatum, Jonah Hill, Margot Robbie, and Arturo Castro. Plans were made for the sequel even before the first movie came out in 2014, with Jared Stern and Michelle Morgan brought on to write the screenplay. However, there were a lot of changes behind-the-scenes over the years, which resulted in Phil Lord and Christopher Miller writing the movie along with Mike Mitchell stepping up to replace Chris McKay in the director's chair. The LEGO Movie 2: The Second Part reunites the heroes of Bricksburg in an all new action-packed adventure to save their beloved city. The story takes place five years after everything was awesome and the citizens are now facing a huge new threat: LEGO DUPLO invaders from outer space. The invaders end up wrecking everything faster than it can be rebuilt. The battle to defeat the invaders and restore harmony to the LEGO universe will take the main characters through new Master Building challenges, a new galaxy where everything is musical, and above all, it will test their courage. After a few release date changes, The LEGO Movie 2: The Second Part will hit theaters on February 8th, 2019. The sequel will be the fourth LEGO movie to be released since 2014, after the original movie, The Lego Batman Movie and The Lego Ninjago Movie, which were both released in 2017. Hopefully everything will be awesome again when the movie hits theaters and that it comes out getting close to the first installment's box office haul of $469.1 million globally. While we wait to find out, you can watch the holiday short below, thanks to the Warner Bros. Pictures YouTube channel.